please contact me for more info and get on my newsletter to receive details on new dates! there is a timeless wild wood deep in a commune of southwestern france, not too far from the wine laden region of Bordeaux, tucked away in a hamlet called saint-vivien-de-monségur. this spiritual vortex, with its own stone circle, is surrounded by agricultural cultivation, fields of ripening aubergine grape vines, maturing flaxen sunflowers, tawny flourishing wheat, budding ears of maize, pungent ruminant hay and untamed savage gardens overflowing with a riotous diversity of flora and fauna, all of which we will leave blessed offerings to as we peruse these heavenly spaces to forage for eco-dye endowments. a creative unsurpassed oasis, SolHenge is rooted in the fabled hydrous Aquitainia of old Gaul, a mythic eleanor queendom full of mystery and magic, historically pagan with traditional ceremonies for planting and harvest, still alive today. witchcraft is practiced, even still, in rural enclaves of Aquitaine, even now, so our unique maker’s coven of witch work at solhenge retreat center will be informed and potent, welcomed and intimate. the feminine element of water, *the element of ecstasy and unconscious bliss, the deep enjoyment of the heart and the flow of love, will marry us to the fecund land as we go about our dreamy days, making and divining in the shamanic studies barn, floating, aqueous, clothing optional, in the in-ground pool for hours, sunning on the edge of the teeming fields, feasting under fairy-light strung druidic trees, and sleeping in or out of doors while the constellations of heavenly bodies soar and swirl encircling us. the quiet 15 acres of secluded woodland valley and private meadows cradle the large rustic French country home where we will stay. classic large bedrooms are shared spaces with single bed accommodations, usually three to a room, and two gorgeous and fully remodeled bathrooms, with luxurious soaking tubs and showers, are ours for the duration. fresh, nonpareil, local, delicious, seasonal, nutritious, sustainable and hand-made vegetarian meals will be provided and served for lunch and dinner in the garden. morning foods, including local eggs, fruit and pastries, will be provided and we will use the well stocked kitchen (refrigerator, stove, tea, herbs, coffee and nibbles, with room for your own snacks and noshy items), in the shamanic studies barn to prepare our own breakfasts, which can be taken languidly poolside, on a woodland picnic, or giving witness to sunrise and so on. the shamanic studies barn is where we will meet in the early mornings for optional physical movement (yoga/dance based), and at other times during our days for meditative shamanic movement, and is also where much of our hand making on sight will take place. my proposal and plea is for us to immerse ourselves in this enchanted landscape and invoke an ambrosial make-to-mend (M2M) experience wherein we stitch, summon, and saturate sacred symbols of our mapped oracular and practiced personal mythology/cosmology onto silk and/or silk/wool blend kimono-style frocks, string bundle with foraged and found flora, fauna and botanicals, then cauldron dyeing our sacred shelter garments and wearing them in simple-ritual ceremony, suffusing them with auspicious songs and mystical poetic vibes from our summer stardust coven. and this slow-stitch work will weave throughout our days, spiraling betwixt and between, leaving ample non-linear time for psychic receptivity/listening from deep within to the interior heart-illuminated space where oracles emerge, or for whatever else your honey-drenched heart desires. this work and experience is all access, meaning, you are being invited to approach it at whatever achievement or not that you have with sewing, stitching, handwork, etc. in other words, no experience is necessary to reap the myriad benefits of hand-making to heal. we will saunter, slowly and with curiosity, into the *vessel of our coven, which will hold us, our tenderized feelings, our raw emotions, our layered desires, our unfurled visions, and even our unconscious dreams, in an embrace of the feminine consciousness. should you, with rapturous delight, desire paying in full to guarantee and secure your spot, you can jump to the shop to purchase and complete your registration for this summer solstice make-to-mend coven experience. i am certainly open to payment plans. i am asking for half down to hold your spot ($986.50), and the rest in payments that you are welcome to set the remittance dates for, so long as you are paid in full by April 1st, 2019, and so long as the terms are reasonable and i can agree to them. email me at smashingrubbish@gmail.com to set up a mutually agreeable payment plan. for those who pay in full, a full refund can be requested in writing, minus a $300 administrative fee, up until March 31, 2019. from April 1, 2019 onward, no refunds will be granted on paid in full registrations. thank you for understanding and by purchasing, you agree to these terms. payments are accepted via PayPal, cash, check or money order. each payment, once made, is non-refundable. investment includes lodging, all meals, gifties and sweet surprises, make-to-mend coven/workshop and 98% of your supplies, including the silk or wool/silk blend fabric for kimono-style frock making, embellishments, dye supplies, etc. your airfare and transportation to solhenge is not included. make-to-mend coven is limited to 16 women. :: bed and self-serve breakfast is kindly offered to each and every M2M coven guest for one night before and one night after their SolHenge stay. the gathering will end at 4pm on June 22nd and accommodation is not included for this night. the optional bed and breakfast arrangement is €50, plus optional in house supper on first b&b night, before gathering commences, is offered at €25, each/all made payable to Sarita Cameron, our hostess, separately. 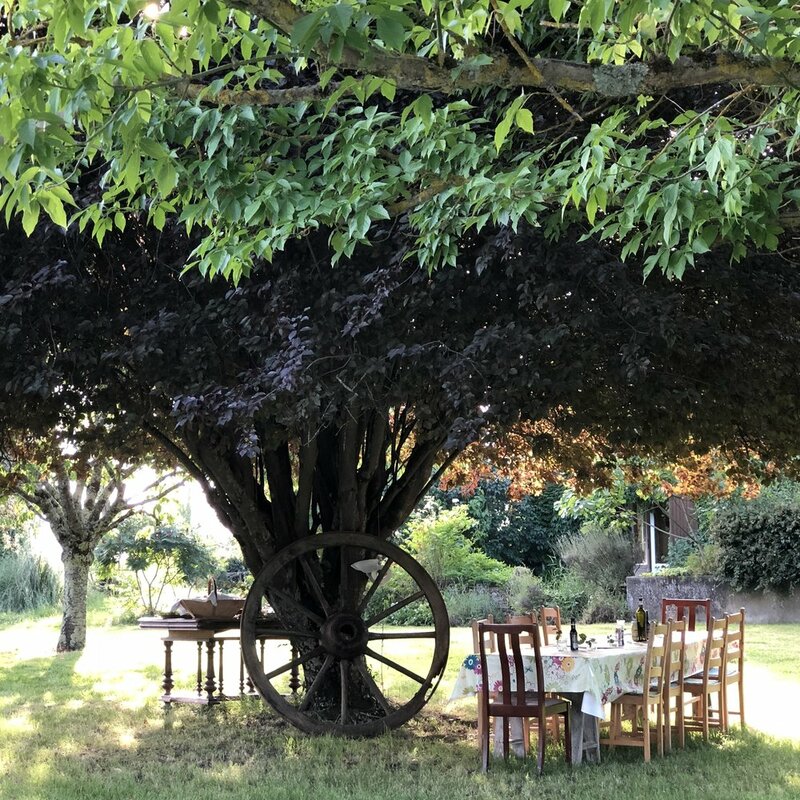 for anyone staying over on the 22nd, we may be able to arrange for a winery tour/tasting plus al fresco meal at golden hour, at a gorgeous nearby winery, with the best tree swing I’ve ever swung on. :: please plan to arrive and check in between 4pm and 6pm on Monday June 17th, if you aren’t coming a day early to acclimate and partake of the pre-b&b offer. garden-scape dinner will be served at 6:30pm on the 17th and we will have an opening evening circle afterwards in the shamanic studies barn. :: each participant is responsible for her own airfare and travel costs. the closest airports are Bordeaux and Bergerac. SolHenge does offer an airport transfer for a generously reduced rate of €50, which is far less expensive than a taxi. transport to train stations also possible. each attendant is also welcome to rent an automobile, alone, in pairs or in small groups, and park in the lot at solhenge, free of charge. also, a vehicle will be available for participants to rent intermittently, on site, should you wish to travel to the local villages, about 15 minutes away, for supplies or grocery items. :: our incomparable hostess, Sarita, will be on hand to welcome us, join us, nourish us and she is a powerful witch offering shamanic healings sessions at €50 per appointment. as well, we will likely have the option to book on-site massage at the likely rate of €50-60/hour. i am not certain of the rest of my travel plans after this gathering but i hope to make my way to Denmark for a couple weeks. sunday morning after the gathering would be a great day to get up early and head to a flea market in Bordeaux (or leave at the end of the gathering on saturday and stay overnight in bordeaux), or to one of the coasts for some beach time, or to Paris for some city time. the possibilities are endless and i encourage you to stay abroad as long as possible! arranging to rent a car before going is simple and i had so much fun cruising all over the south of france last summer! please feel free to connect with other participants and make joint travel plans if having a sojourning buddy abroad helps. we will all stay connected via email once we get a handful of participants committed to covening with us. if you have any further questions, concerns, or need any help whatsoever, please don’t hesitate to reach out.